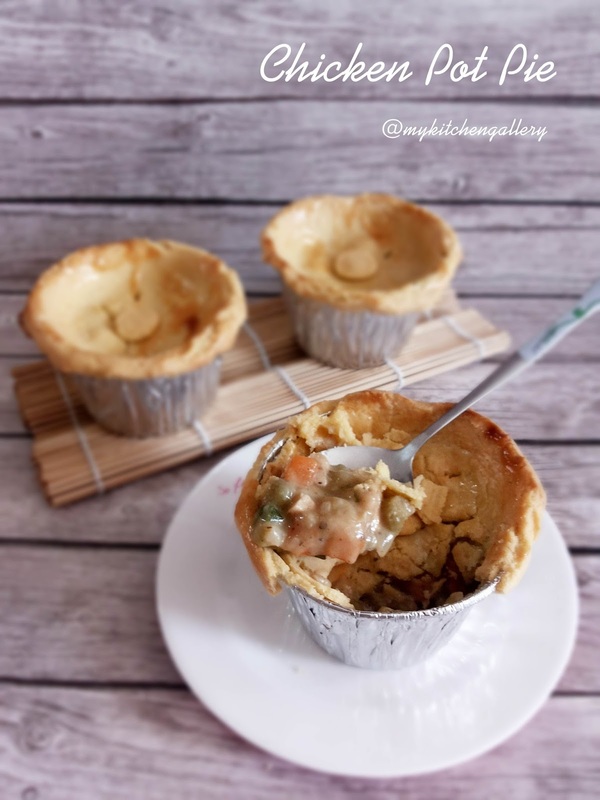 Happy weekend all,, Delicious breakfast 'Chicken Pot Pie' to rock on sunday.. this chicken pot pie is really yummy, the not so creamy chicken filling just perfect with the flaky pie crust. 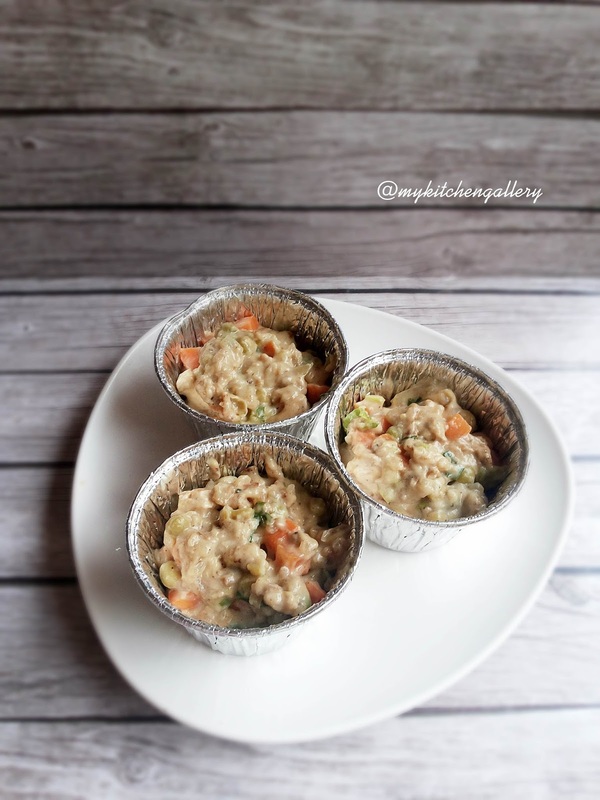 i got the filling recipe from Jennycancook food blog with video. For the pie crust i am using my usually pie crust recipe which used butter. For more healthy choice, you can follow jenny recipe that use oil instead of butter. Next time, i will consider to put more milk or water to create some soup inside the pie. also i will put some potato. Just thinking, the taste will really yummy! Filling, preheat oven to 400° F.
Heat the oil in your biggest pan over med-high heat. 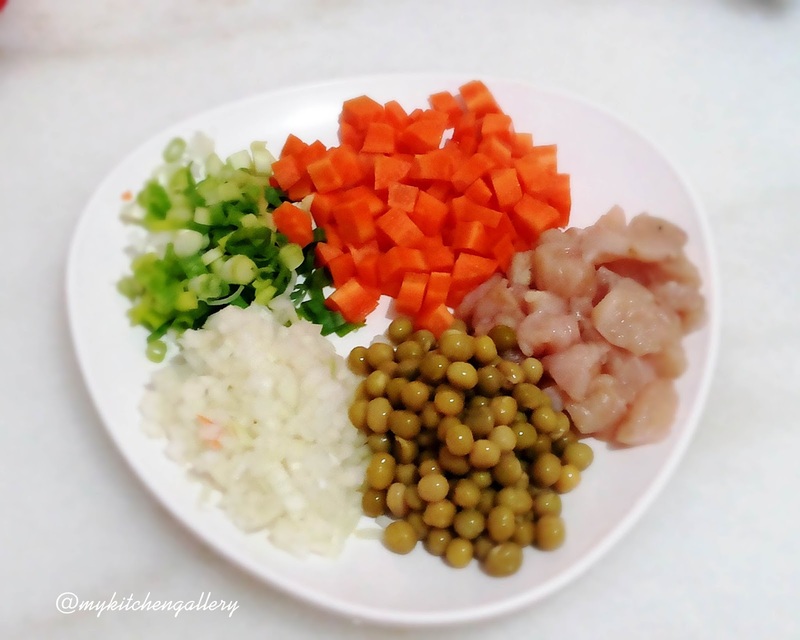 Cook and stir onion, carrot, & celery for 2 minutes. Add chicken. Cook & stir for 2 minutes. Stir in peas followed by chicken stock mixture, salt & pepper. Cook, uncovered, for 2-3 minutes until thick. Pour into aluminium foil cup. Set aside. Place on a foil-lined baking sheet. Bake for 25 minutes. Let stand at least 20 minutes before serving. * For 3 cup chicken pot pie only need around half recipe of pie crust, for leftovers pastry dough i use to make 6 or 7 small pcs onion cheese pie.